Things are getting hectic around me since that big day. It's not so much of the workload in the office, but rather the difficulty in managing the combination of the daytime work and the chores I need to do at home. Last week was another big challenge. 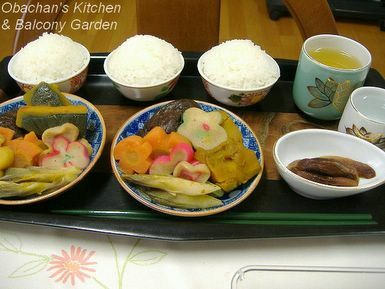 In some traditional areas in rural Japan, people offer special meal to their ancestors during Higan period which is about a week around spring or autumnal equinox day. My parents have kept that custom, so last week I needed to prepare that special meal every morning in addition to the dishes for my dad. That ritual meal has to be strictly vegetarian; you are not even supposed to use animal broth to simmeri vegetables. But luckily the shiitake mushroom gives some good flavor, so taste is not the issue. The issue is having to prepare extra meal when I have to hang laundry before going to work. I managed it for a couple of days with no problem, but from the 4th day on, I felt so much burden on my shoulders. Then I heard that mom is going to move to another hospital. This coming Friday, my aunt and I are going to help her move to a hospital in the neighbor city. Hope it doesn't make her unhappy. As I wrote on my foodblog, we got an endorsement from a domestic geopark committee about a week ago. Oh, it was a BIG day. TV crews from all the local broadcasting companies (we only have four)... People from several newspapers... When our chief answered the phone from the committee, we couldn't tell for a while if it was a good news or a bad news from his facial expression. Then he put the phone down and told us the good news. We let off firecrackers and shook hands with each other. :D But we all knew that it was just the beginning ... beginning of another long agony. Or, to put in a more positive way, another "challenge." BIG CHALLENGE. I'm just happy that I'm not facing this challenge alone. So, that is my situation in August, 2010. (Those who missed the beginning of the story, please read the previous post first.) But Mom's operation and my work were not all the challenges I have to face. Here's my dad -- who shouldn't be, and cannot be forgotten. Let me tell you something. He suffered from hypochondriasis from his late 30s to early 60s. By the time he was 45 years old, his name was well-known at all the hospitals in the eastern part of the prefecture (well, we only have a handful of hospitals there anyway), because he always insisted that there was something wrong with him and the doctors had to refer him back and forth among their hospitals. Finally he did get sick and had an operation, and after recovering from it, his health complaints have subsided. Well, at least, it looked that way, until this summer. But soon after mom started seeing the doctor, dad started complaining about his health. He says that his legs are mildly paralyzed and he has trouble walking. A couple of weeks before mom got her worst diagnosis, dad started his pilgrimage to hospitals, with the doctor always saying, "Well, there seems to be nothing wrong..." Then mom's diagnosis seems to have pushed him into full-blown hypochondriasis. Finally! The worst part is over. Well, maybe I shouldn't say that because it was not really the "worst" -- I did enjoy some of the new experiences after all -- and also, things can get worse from now on. Anyway, where should I start? Mom's operation, maybe. As I posted on my foodblog, mom had been complaining about her foot problem for years, and she finally went to see the doctor several months ago. After visiting 2 different hospitals without getting a clear diagnosis, at the 3rd hospital (University hospital), the doctor found two masses that looked like tumor. After they examined one of them, she was told that they were benign. But the doctor checked out the other one just to make sure, and it was found malignant. Also in her MRI (I guess?) there was a spot in her lung that could have been another tumor metastasized from the one in her foot. Luckily, PET scan found out that the one in her lung was not malignant. However, to minimize the risk of metastasis, she agreed to have her left foot cut off. That was the end of July. She was obviously shocked, and I felt devastated. Of course I felt terrible for her, but I have to admit that I was more worried about how it would affect me -- my work, especially. As I had written before, since May 2010, I have been working for a promotion committee that is trying to make our hometown a geopark. The place was approved as a domestic geopark a few years ago, but the attempt to join the global network of geoparks has not been successful, and this year we are going to give it our best shot. Since the beginning of this year, the committee has been working harder than ever, attending meetings after meetings, improving tourism-related facilities and running loads of events to promote our geopark and educate the public. And this August was full of important events, including an on-site evaluation by Japanese domestic geopark committee for the endorsement to apply for a membership of the global network. It has been the dream of many local people here, so it is like "We can't fail this time!" because we already failed twice before. Recently I often go to the cape and practice tour guiding. (I'm a volunteer tour guide of the local geopark.) See? I'm doing my best to stay active in my jobless days. Honestly, it is nice to be close to the nature when you are a little tired of people and their lip services. The rocks are silent and they show us a totally different kind of time span, which often heals me a lot.